LERWICK’s historic town centre has joined an exclusive list of ten “cool shopping districts around the world”, published in Friday’s Guardian. The magic of Lerwick’s Commercial Street is on a par with shopping districts in Paris, St Petersburg and Copenhagen, according to the list complied by the newspaper’s readers. Living Lerwick manager Emma Miller said she only knew of the unexpected publicity after people had mentioned it to her on Friday morning. She said she was “really pleased” to see it on the list. 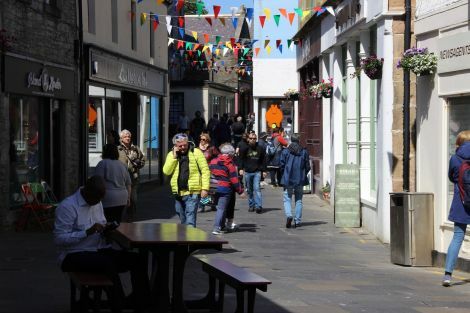 “I actually think our town centre is really diverse and offers a great range of goods and services for the size and geographical restrictions of our population/location,” Miller added. FIFTY drivers have been breathalysed so far by local police as part of this year’s festive drink driving campaign, which got under way on 1 December. Area commander Lindsay Tulloch said that one driver has been arrested for being over the limit while several others have been warned after traces of alcohol was detected. “We want to prevent people from drinking and driving and realise the dangers and damage such action can cause to themselves, family and the community,” the chief inspector said. “If you plan to enjoy a night out and have a drink, make sure you plan how you will be getting home and do not be tempted to drive after drinking”. 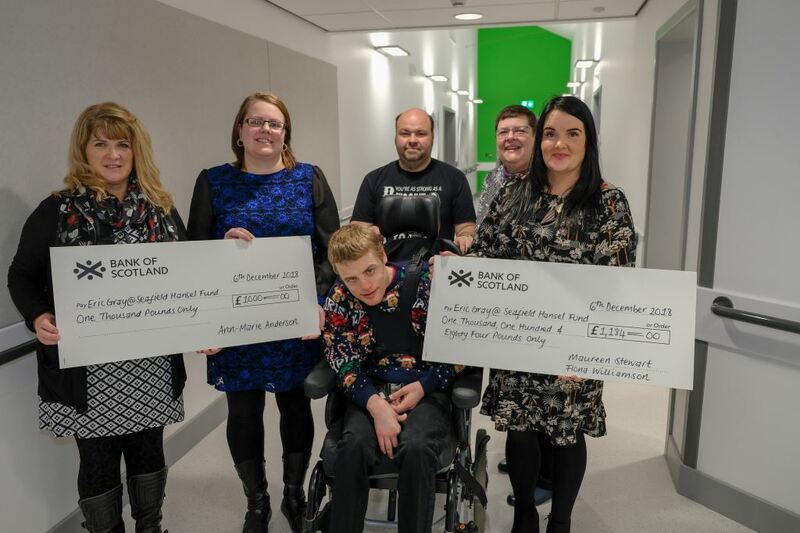 A FUND created to help pay for additional equipment at the new Eric Gray @ Seafield centre has reached almost £62,000 after benefitting from two further donations. The Hansel Fund received cheques totalling £2,184 from two families connected with the centre, £1,000 from Ann-Marie Anderson, sister of service user Robert Anderson, as well as £1,184 from Fiona Williamson and Maureen Stewart. A number of donations have been made as the building work has progressed, including £10,000 from the Shetland Special Needs Action Group, £3,145 raised by a group of staff who walked the West Highland Way, £1,613 from a sponsored walk by service users, and £1,081 raised by service user Dylan McDougall. The new Eric Gray @ Seafield centre is due to open in January 2019, and it will provide specialist day services for adults with learning disabilities, autistic spectrum disorders and complex needs. Artists Andy Anderson and Aiden Ward with Gaada’s Amy Gear and Daniel Clark outside the pop-up shop on Commercial Street. A WINDOW display is being held on Lerwick’s Commercial Street marking the culmination of a 12-week series of workshops held by local art organisation GAADA and Disability Shetland. The Screenprint Show is taking place opposite Specsavers from 12 to 18 December. 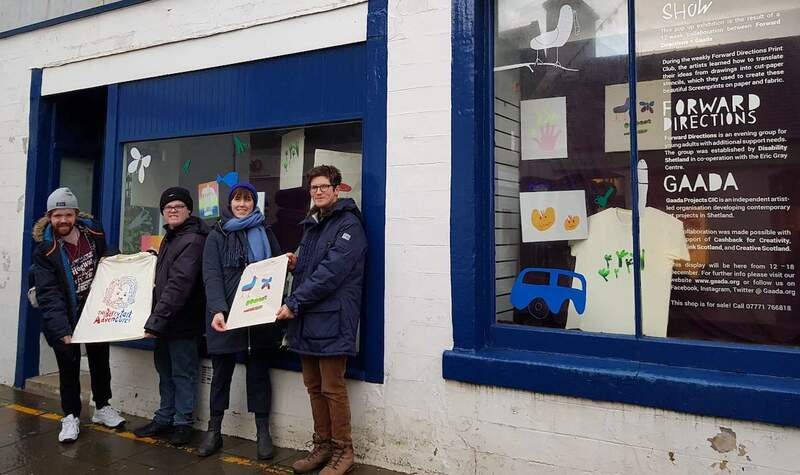 The artwork on display in the vacant shop window comes courtesy of Forward Directions, a local group established by Disability Shetland that includes young adults with additional support needs. Burra based Gaada – run by Amy Gear and Daniel Clark – received support from Cashback for Creativity, YouthLink Scotland and Creative Scotland for the project.